Ziptrek Ecotours Over Queenstown - Face Your Fears! Ziptrek Ecotours Over Queenstown – Face Your Fears! Home Travel Blogs Activities Ziptrek Ecotours Over Queenstown – Face Your Fears! One of the greatest things about Queenstown, alongside its incredible alpine scenery, is the amazing adventure activities! After all, this is one of the main reasons why Queenstown attracts visitors from all over the world. Whether you love the water, the mountains, or the forests, there will be an activity which is perfect for you. It also provides a great opportunity to do something which is slightly outside of your comfort zone. Pushing the boundaries of what you thought you were capable of makes for a very memorable visit to this country! One such company that offers a quintessentially Queenstown experience is Ziptrek Ecotours – if you have ever wondered what it’s like to soar like a bird, this is the tour for you! Ziptrek Ecotours offers all of the thrills that you would expect from a nature activity in this area, but they have a strong sustainability focus too. They are aware that tourism can bring with it quite large social and environmental challenges, particularly in Queenstown which takes on a sizeable chunk of New Zealand’s tourists, and especially during peak season. 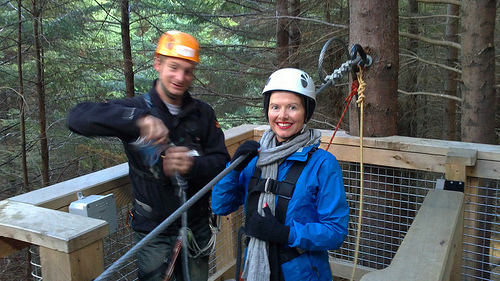 So, Ziptrek Ecotours works hard to offset their impact through their ‘Tiaki’ approach. This is a promise to be respectful guardians of New Zealand’s natural environment. This translates to powering their site through solar energy, native shrub and tree-planting programs, and eradicating the invasive wildling pines from around Bob’s Peak. They also work hard to educate visitors on their tours about sustainability, and to inspire care for the natural world through fun and thrills. That definitely sounds like an genuine ecotour in our book! 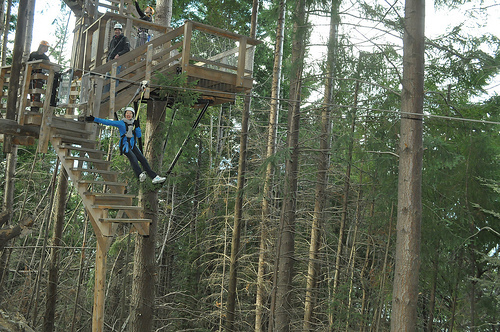 Put simply, a ziptrek is an outdoor course made up of interconnecting ziplines through a forest. You zipline from one treetop platform to another throughout the tour, allowing you to see the forest canopy from an entirely different perspective. It truly is like being a bird! 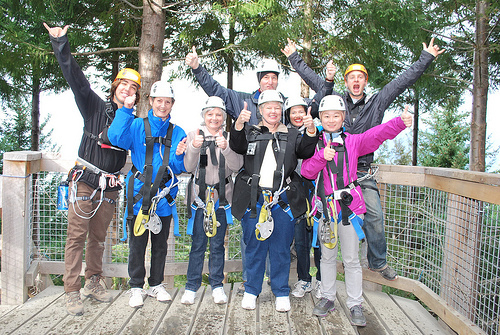 Ziptrek was originally started in Whistler, Canada, but was bought over to Queenstown in 2009 to take advantage of the similar appetite for adventure ecotourism. 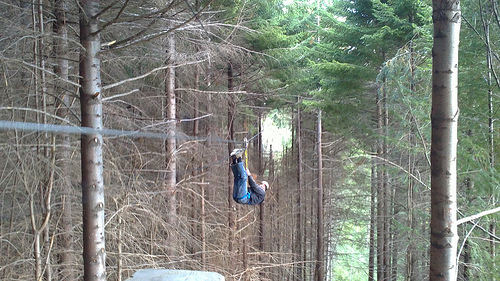 Ziptrek Ecotours is now home to four different zipline routes through the forest, varying in length and intensity! 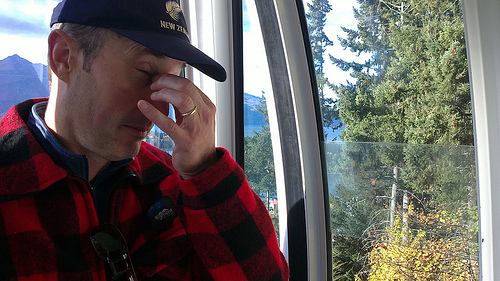 Please note: Ziptrek Ecotours is only accessible via the Queenstown Skyline Gondola. This means that you must pay the Gondola Company for a 2-way ticket (even though you’re only using the gondola 1-way). Yeah, the photo says it all. I know it’s a bit of a forced smile! The first flying fox is the easiest, but also the hardest to overcome your fear. They always say that the first is the worst! Taking those last three steps off the platform is a real act of faith – but I have no intention of turning back now. I breathe deeply to accommodate the sudden rush of air into my lungs, and suddenly I’m suspended in a moment of sheer joy. The valley echoes to my happy squeals. I did it! Sometimes you get to bond really well with others in a small tour group, and today we’re struck gold. It’s jokes all around, and we encourage each other to overcome our nerves. The tour guides are loving it! We’re ziptrekking with some lovely ladies from the USA, who have very strong southern accents. The word “hang” sounds like “hi-ang” coming from them! Like me, they were apprehensive at first, but after the first experience they’re hungry for more. One of them, a spritely 70-year old, accepts a challenge to “hi-ang” upside-down all the way on this one! For more adventurous Queenstown activities, check out our dedicated nature and lifestyle activities!